The Jaipur Column is made of sandstone and atop is a five tonne bronze lotus from which emerges a six-pointed Star of India, made of glass. The Star was installed in the year 1930. The lotus is one of the few Indian motifs that have been incorporated by Lutyens in the construction of Rashtrapati Bhavan. The imperial eagle also embellishes the four corners at the plinth of the column. It is interesting to note that inside the column a steel tube runs, tying the lotus and the star to a block in the foundation. The first stone of the column was laid by King George V and Queen Mary on December 15, 1911. Jaipur Column has bas reliefs facing north and south. 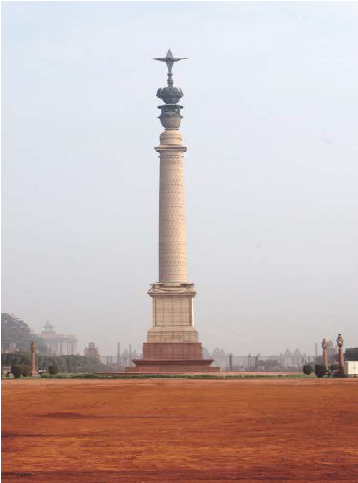 On the eastern side is the map of Delhi as then envisioned while the inscription that runs through three sides of the column reads. A statue of Lord Hardinge was placed at the foot of the Jaipur Column earlier. However, the statue was removed and shifted post independence to Kingsway Camp, the site of the 1911 Coronation Durbar. The ceremony was opened for public viewing in the year 2012 at the initiative of President of India.